Matt hears the words, but he can’t believe them. He’s Thor’s representative? 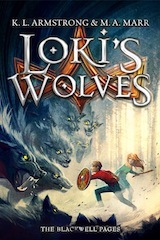 Destined to fight trolls, monstrous wolves and giant serpents…or the world ends? He’s only thirteen. While Matt knew he was a modern-day descendent of Thor, he’s always lived a normal kid’s life. In fact, most people in the small town of Blackwell, South Dakota, are direct descendants of either Thor or Loki, including Matt’s classmates Fen and Laurie Brekke. No big deal. But now Ragnarok is coming, and it’s up to the champions to fight in the place of the long-dead gods. Matt, Laurie, and Fen’s lives will never be the same as they race to put together an unstoppable team, find Thor’s hammer and shield, and prevent the end of the world. In their middle grade debut, K.L. Armstrong and M.A. Marr begin the epic Blackwell Pages series with this action-packed adventure, filled with larger-than-life legends, gripping battles, and an engaging cast of characters who bring the myths to life. Rights sold in North America, UK, Brazil, China, France, Hungary, Poland, Romania, Russia, Thailand & Vietnam.